Designed to pre-measure and inject 1/8 oz. of dye with each stroke, this is the most precise and accurate injection system on the market, eliminating waste yet providing sufficient quantity for a majority of passenger vehicles. 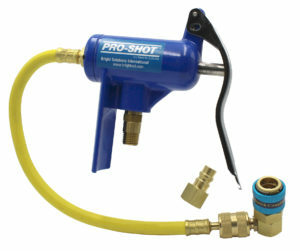 Ideal for injecting into closed, filled A/C systems up to 250 psi and made of robust die cast alloy. The injector can also be fitted with a low side snap coupler for use on R-1234yf A/C systems.